In his work, "The Life of Beethoven", the American historian Alexander Wheelock Thayer reported in chapter VII, "The Compositions Written at Bonn, 1786 - 1792", that "the most interesting compositions in the Bonn period are unquestionably the cantatas on the death of Joseph II and the elevation of Leopold II" (Thayer 119), subsequently turning this section into an "all-over-the-place journey" on the subject, while Maynard Solomon, in his Beethoven biography of 1977, dedicates to the "creation history" of both works (which is accomplished in a chronological manner) one entire paragraph and to the further fate of the compositions a further single paragraph, in order to immediately turn to a discussion on the importance of these works. The study of both texts, as they present themselves to the readers in the above works, may throw them or her into a state of "chronological confusion" (by Thayer) or, as in Solomon's concise biography (with its overall length of 400 pages), out of necessity, into a "hurried sense of briefness" that might not make both works accessible to them in such a way that a "chronological understanding" of them can be derived from this reading material, and that would enable the readers to work on their own understanding of this concept in order to increase their listening enjoyment, while both above "modes of presentation" may very well provide a "first overview" with respect to the se work. Therefore, it is the purpose of this "creation history" to present the history of the creation, performance/non-performance, and further fate of these works in such a "chronological manner" that will assist readers in attaining such a "chronological understanding" of these works before their first listening experience, whether or not they are already familiar with the above overviews or not. 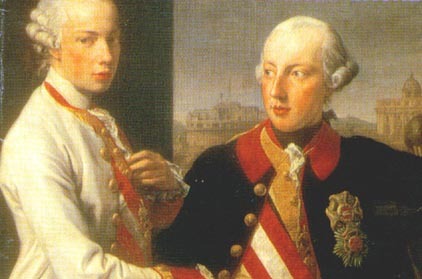 News of Emperor Joseph II's death in Vienna on February 20, 1790, reached his brother Maximilian Franz, the Elector and Archbishop of Cologne in Bonn on February 24th. The Bonn "Reading Society" immediately planned a memorial celebration that was scheduled for March 19th and that subsequently also took place on that day. From Schneider's "Elegy on the Death of Joseph II"
But you did not vanquish it entirely. And trod on his head. With the rays of Heaven. By his suggestion that a cantata should be performed at the memorial celebration, to the already completed text of which one of the 'excellent musicians from among our ranks' might offer their services (with whom he might, out of politeness, have referred to Christian Gottlob Neefe or Reicha), but perhaps also "an outside composer, who will apply himself to his musical task," he might have opened 'the door' for Beethoven to this possibility, since the latter, during this winter semester enrolled as a lay student at the University of Bonn, was not allowed to become a member of the 'Reading Society' ('outside composer' thus referred to a composer who was not a Society member). Here, we should mention Cooper's second argument with respect to Beethoven's compositional activities of the years 1787 - 1789. He contents that Beethoven might not have received this commission had he not shown his progress as a young composer in some works that he produced during the previous years. (For more details, please refer to the Section Beethoven's Later Bonn Years of our Biography Pages). No princely serf can achieve this. Mine is not the last. From this context and also from the further fact that Beethoven's most important patron of that time, Count Waldstein, was also a member of the "Reading Society", one could at least arrive at the possiblity or even directly derive it therefrom how Beethoven received his commission to write this cantata. Already two days before the planned performance of this work it was obvious that it was 'not' or 'not yet' available. The laconic comment in the protocol of the 'Reading Society' of March 17th reads, "The recommended cantata cannot be performed for various reasons." "As far as the music is concerned, Beethoven has produced such a densely written sonata on the death of Joseph II - the text is by Averdonk - that it can only be performed here by a full orchestra or other similar body." On the one hand, this "time frame" confirms Thayer's comment that the work "was written between March and June, 1790" (Thayer 119), while the facts mentioned in this report for the "various reasons" hint at the "qualitative character" of the work as a full orchestra work in which Beethoven had left behind the "orchestral possibilities" offered him in Bonn and thereby might also have created his first "master work". Further, it can be noted that this also meant that the work could certainly not be performed by the number of musicians that were available to the "Reading Society" and that, according to the reports of musicologists, on the basis of their (later) study of the score, "the lack of string players precluded any proper balance between the winds and the strings." The demands that Beethoven, in the creation of this cantata, put to the musicians are described as "challenging and out of the ordinary" but "in no way unplayable", while Nikolaus Simrock later emphasised that "all of the figurations in that cantata seemed 'most uncommon'," but also insisted "that they could all be executed," and that "the musical substance could not be given its adequate expression because there were simply no models." (All quotations from: Irmen). The 'Elevation of Leopold II to the Imperial Dignity' on October 9th, 1790, to which Maximilian Franz, but also certain composers of the "First Viennese School of Music" would travel (3), gives us a further "time frame" for the creation of this second cantata. Unfortunately, it can not be determined with certainty as to whether the Elector Maximilian Franz commissioned this work from Beethoven or not. The writing of this text by Averdonk is also more assumed than certain. For a complete listing of both texts, we refer to (4) in our general "notes" to this history, in which the text of the "Final Chorus" of the "Leopold Cantata", a direct quotation from Schiller's "Ode to Joy" with "Stuerzet nieder, Millionen!" (Bough down, you millions), creates an itneresting link with this work. To the "general quality" of this text and to its "thematic relation" to the "Ode to Joy" and to the "spirit of the times", we can not provide any further comments in his short chronological presentation. At least the "Joseph Cantata" was rehearsed by the Bonn musicians in the fall of 1791 in Mergentheim in order that it could be eventually performed there. That this project had to again be "abandoned" was mainly due to the already mentioned "orchestral difficulties." From Beethoven's biographical data it is also known to us that he would at least have shown the "Joseph Cantata" to Haydn during the composer's spring/summer visit of Bonn on his return from England and that he might have earned himself his "ticket to Vienna" on the basis of Haydn's impression of this work. Both Thayer and Solomon mention that Beethoven did not offer these works to the public during his lifetime and that they were thus, "dead to the world" (Thayer 119). In spite of this, the material still found its way into the soprano aria with chorus for the first part of the second finale of "Fidelio": sostenuto assai, "O Gott! O Gott! welch' ein Augenblick!" Later, Nottebohm was at least able to note that manuscript copies of these works were listed in the April 1813 auction catalogue of the library of Baron von Beine. Perhaps on the basis of Nottebohm's reference to the manuscript copies it was then concluced that these copies might have been purchased by Hummel and that they found their way from his estate into the second-hand bookstore of List and Francke in Leipzig, where Arnim Friedmann of Vienna bought them in 1884. Once these copies had found their way back to Vienna, the Viennese music critic Eduard Hanslick made Viennese readers acquainted with them in his May 13, 1884, article in the newspaper "Neue Freie Presse". Subsequently, the "Joseph Cantata" was performed in Vienna in November, 1884, and in Bonn on June 19th, 1885. Both works were then included in the "Complete Works of Beethoven." "Even if there were no name on the title page none other could be conjectured!--It is Beethoven through and through! The beautiful and noble pathos, sublime in its feeling and imagination, the intensity, perhaps violent in its expression, moreover the voice leading and declamation, and in the two outside sections all the characteristics which we may observe and associate with his later works" (Thayer 120). This "creation history" did not make any "direct attempt" at comparing these works with Beethoven's soon-to-emerge plans to "write music to every strophe" of the "Ode to Joy" (about which Bartholomaeus Ludwig Fischenich wrote to Charlotte von Schiller on January 26th, 1793). Whoever finds time to listen to these works carefully, might perhaps discover the "thematic connection" by him or herself. (1) To the "subsequent fate" of Eulogius Schneider, Frida Knight has to report in her work "Beethoven and the Age of Revolution" that the latter, from 1792 on, actively participated in the French Revolution in Strasburg and that he became acquainted with Rouget de Lisle, the writer of the "Marseillaise" and that he even translated its text into German, that he wrote revolutionary poetry and prose, became Vice President of the "Republican Club", was appointed "Public Prosecutor" and "Commissionary of the Revolutionary Army," but that he, under Robespierre, soon fell into disvavor, was arrested by Saint-Just, launched a final desperate appeal to the Paris Jacobins that was incercepted by Robespierre, and that he died under the guillotine on April 19, 1794. (2) Thayer reports that Averdonk's father was an employee of the Bonn Court an that his sister was that Helene Averdonk who, years before, as student of Johann van Beethoven, performed with the seven-year-old Ludwig van Beethoven at his first concert in Cologne. (3) Maynard Solomon mentions in his biography, "Mozart - A Life" that Haydn attended the Coronation Ceremony as an invited guest while Mozart had to travel there on his own expense. Joseph, the Great One, is dead! and the sun warmed with the rays of Heaven. touches my cheek like a breath from the grave. until the Day of Reward. will release him to eternal crowns. with pain until his last breath. Let the great Prince gently rest! and the terrors of darkness disappeared. at what came down from Olympus. the lightning has seared the skies. the tears of tne nations have dried. It clears and what do I see! our Emperor, Prince and Father, it is he! Flow, tears of joy, flow! Do you not hear the tidings of the angels above you! Germania! resound more sweetly than the tones of a harps? Jehove looked down from Olympus. the fullness of his blessing? the smile of humanity floating on his lips. How my heart pounds with joy! and how the people's joy rang out in the sky! who blessed you with this salvation! Ring out, you jubilant choruses! So that the world can hear it loud and clear! He brought us peace and salvation! Irmen, Hans-Josef. (Text booklet to CD), 1995 Koch International GmbH. Knight, Fida. Beethoven and the Age of Revolution. London: 1973. Lawrence & Wisehart. Solomon, Maynard. Beethoven. New York: 1997. Schirmer. Solomon, Manyard. Mozart - A Life. New York: 1995. Harper Collins. Thayer's Life of Beethoven. Revised and edited by Elliott Forbes. Princeton: 1964. Princeton University Press.